We're going back to Stars Hallow! The original cast of the Gilmore Girls, including Lauren Graham and Alexis Bledel, are returning to the revival of the comedy drama series due to be out on Netflix in 2017. Netflix and Warner Bros. Television confirmed that the streaming service is officially reviving the much-loved U.S. TV series, after rumors circulated back in October 2015. At the time, it was reported Netflix bosses were looking to revive the series with four 90-minute movies, rather than a traditional 10-episode series. Lauren Graham acknowledge the rumors on Twitter and wrote, "Dudes. I can't confirm this. But I also can't deny this..."
Since the news broke that the Gilmore Girls is officially returning to the small screen, Graham subsequently posted a photo of her posing with a jacket embossed with, 'Property of the Gilmore Girls.' She captioned the image, "I CAN NOW CONFIRM: it's time for me, and this jacket I stole in 2007, to return to work. 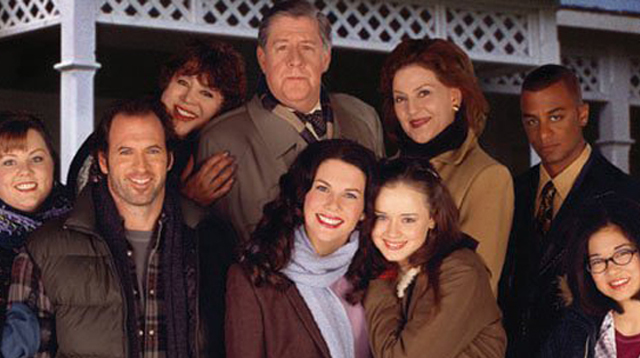 @netflix #GilmoreGirls". Other cast members, including Scott Patterson, Kelly Bishop, Sean Gunn, Yanic Truesdale, Rose Abdoo and Keiko Agena, are also set to return to the series, with creator Amy Sherman-Palladino and husband Daniel Palladino writing and directing all of the Netflix episodes. The couple exited the series in 2006 due to a contract dispute. Amy revealed last year that she was upset she didn't get an invitation to return to the show for its final season in 2007. "It's always a bummer when you don't get to end it," Amy said. "I had hoped maybe that there would have been a call, 'Hey, it's the last episode, do you want to come back?' And there wasn't. But that's OK, that's not the way it works in Hollywood where there are rules." However, Melissa McCarthy, who featured in the show as Sookie St. James, is unlikely to be returning—her career has skyrocketed since the show ended, with starring roles in Bridesmaids, The Heat, Mike & Molly, and the upcoming Ghostbusters reboot.